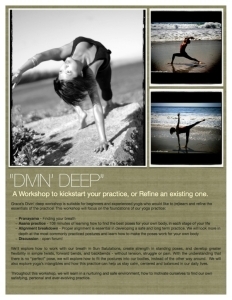 The Divin’ Deep Yoga Foundations/Principles workshop allow the practitioner to where dive in as Grace breaks down the most practiced postures in today’s vinyasa based classes. It is perfect for yogis that have a foundation in yoga already as well as experienced practitioners and teachers. Soulful Sequencing is designed to help both new and experienced teachers to understand the art of sequencing a practice that takes the practitioner through what is essentially a “life cycle”. There is a beginning, or birth, moving to the peak of practice or our life cycle’s peak, and then the inevitable sunset as we descend back to our original state, ultimately to a space of rest for our body and mind. We learn how to select a focus and build a practice around a theme or peak posture that has good flow, and intelligently selected movement principles to properly warm up our body, without sacrificing the artfulness and creativity of the teacher or practitioner. With mindful sequencing, the practice begins to serve the practitioner rather then the practitioner serving the practice. Please email workshop@graceflowersyoga.com if you are interested in bringing this workshop to your studio. We spend much of our time in modern society either sitting, driving, or hunched over a computer which takes a toll on our physical body which then trickles into our emotional lives. In this illuminating immersion workshop, we will unravel the mysteries of backbends: their complex physical and energetic makeup and what makes them such potent asanas (postures). Foundational understanding of yoga postures and sun salutes. Props, variations and modifications will be offered. Throughout this workshop, we will learn in a nurturing and safe environment, how to motivate ourselves to find our own satisfying, personal and ever-evolving practice. Grace’s Divin’ deep workshop is suitable for beginners and for all of us who would like to (re)learn and refine the essentials of the practice! Asana practice – 108 minutes of learning how to find the best poses for your own body, in each stage of your life. Alignment – Proper alignment is essential in developing a safe and long-term practice. We will look more in depth at the most commonly practiced postures and learn how to make the poses work for your own body. We’ll explore how to work with our breath in Sun Salutations, create strength in standing poses, and develop greater flexibility in simple twists, forward bends, and backbends — without tension, struggle or pain. With the understanding that there is no “perfect” pose, we will explore how to fit the postures into our bodies, instead of the other way around. We will also explore yoga’s intangibles and how this practice can help us stay calm, centered and balanced in our daily lives. In this workshop, we will move through a well rounded asana practice to prepare for a variety of arm balances. Taking flight is an art, a creative process of exploring that delicate balance of strength, flexibility and breath that enables us to experience “flying” with ease. The pace of our everyday Vinyasa yoga class doesn’t often allow for us to really get into the nitty gritty of the vinyasa sequence. Join Grace for this two and a half hour workshop in which we will zero in on the breath, asana (posture), and transitions that will help your practice flow with more grace, intelligence, safety, and ease. This workshop is suitable for both beginners and seasoned practitioners looking to deepen and refine their understanding of the elements of the vinyasa sequence. In this workshop, we will explore all the questions you have about the “Vinyasa” in the yoga practice in a safe and nurturing environment. Roots – Where did Vinyasa come from and what exactly is it? Sanskrit terms for a Vinyasa yoga class so you can walk into any Vinyasa class and dive right in. BREATH is the foundation of a Vinyasa practice. We will dive into Ujayii breathing and learn methods to sustain our breath as we move as well as learn a few Pranayama (breathing) techniques. Journey through a step by step breakdown of postures that make up the Vinyasa sequence. Exploration of proper injury prevention to create a safe and healthy yoga practice! Practice! We will navigate our way through our very own Vinyasa practice! Finally, we will put it all together in a fun, challenging Vinyasa flow that will allow you to integrate and solidify what you have learned into your everyday practice. You will leave with a solid foundation that will enable you to hop into any future vinyasa yoga classes you’d like!